Join us for a night of fun, food, games and more - 101 is the combined ages of Tracy, our Executive Director and Darlene, our artistic director - we won't divulge the exact numbers, but they are both having a birthday in February and we are celebrating and you're invited to attend! They don't want any gifts for themselves, but would rather you contribute something from our WISH LIST for the Playhouse - that's your admission. 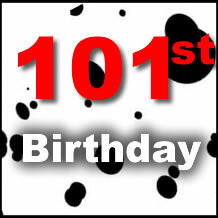 Thank you to everyone who attended and/or donated items for the 101st Birthday Party on February 15th. Team Tracy was the winner of the night but the real winner was Playhouse on Park. Tracy and Darlene are so grateful for all the generous contributions. If you missed the party but still want to bring a birthday gift to the Playhouse, please do so anytime! Here is the updated wish list. A fun event that helps benefit the Playhouse - donations from the Wish List, large or small, are the only price of admission. Games (last year there was a bit of a rivalry: are you Team Tracy or Team Darlene? ), food, and fun will be had by all.